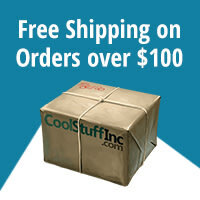 More Than 550 High-Quality Components! Blimey! You and your blokes have been unfairly banished and stripped of everything but a few shillings and table scraps. 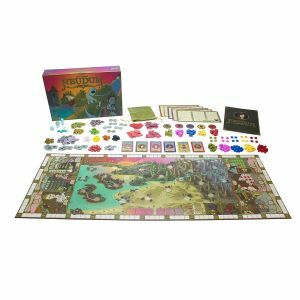 Undaunted, you journey to a stranger land to reclaim your honor. Under the steely gaze of her majesty, Queen Anne, you must chart your path to fame and glory. Will you farm the earth, fight as knights or finagle your own feudums? Whatever your fate, one thing is clear: Medieval life is not a bowl of cherry tarts. Fertile Land is scarce, food is dwindling, and fanciful creatures fancy you for dinner! Luckily, not everything feudal is (ahem) . . . futile. If you seize control of the local guilds, you could become the most venerated in the kingdom. The object of Feudum is to be the "most venerated in all the land." Less loftily put, players try to score the most veneration points over 5 epochs. 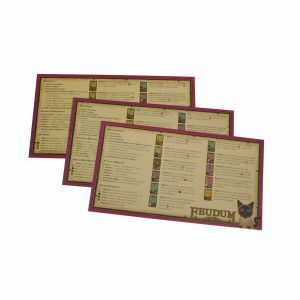 Each round, players use action cards to move pawns, influence locations, interact with guilds and a slew of other things. 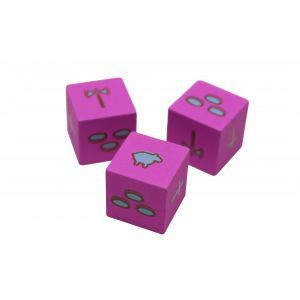 During the game, you will secure memberships status in different guilds by putting pawns and/or feudums into play. You will also race to rule locations, as this reinforces your guild status, and unlocks additional actions. Latecomers must settle for serfdom, but this can be advantageous! Players who hurry to improve locations in each region are rewarded immediate veneration points and region tiles! Tiles can be traded for any good, or used by your serfs to tend landscapes. As tiles are drawn, the dawn of each epoch is triggered and veneration points are scored for status in the guilds, landscapes tended, and regions in which you are active. If you are ambitious, you may acquire a feudum to become a vassal and increase your guild status immensely. 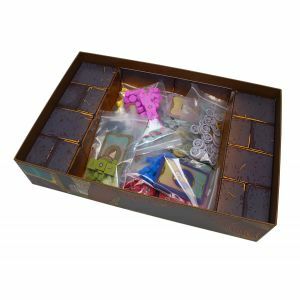 However, you then must pay homage to the king by conquering opponents throughout the game to avoid negative veneration points for disloyalty. All players may trade with guilds to get the resources they need. However, only guild members may move goods from guild to guild in return for immediate veneration points! You may decide to thwart the flow of goods, but be warned, a player could throw you a "feast" and perform your guild powerswhile you are incapacitated. When one region tile is empty, the game ends and final veneration points are scored. The paths to victory are many! Will you rule locations or humbly tend landscapes? Be a dutiful vassal or avoid royal obligations? Fortify your feudums or expand your kingdom? Rest assured, your foresight and finesse will prove fruitful. Unless you are unwittingly bludgeoned by a lumbering behemoth. Long live the king! 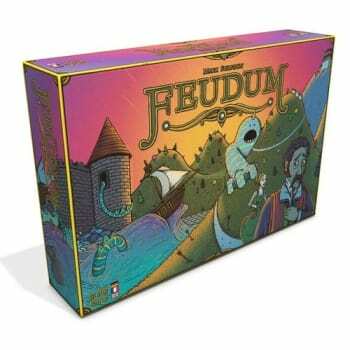 Several expansions are available to add to your Feudum experience! Check out Alter Ego to switch up the actions available to players before the game begins! Take to the sea for new sources of food in Seals & Sirens, but beware the alluring song of the Siren! New challengers to your supremacy arrive in the land in Windmills & Catapults, not to mention the new landscape tiles that will introduce new twists to the game! Finally, Squirrels have taken over the kingdom, adding a multiplying food source and some lovely trees in Squirrels & Conifers! The kingdom awaits you as you fight it out for veneration and supremacy! 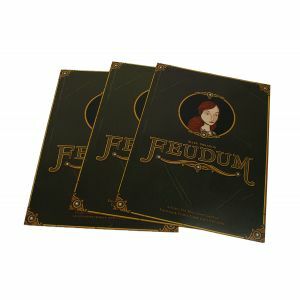 Pick up your copy of Feudum today!